Transition metal alkylidene (or carbene) complexes play a very important role in the organometallic chemistry. Such complexes not only have a fundamental bearing on the theory of coordination chemistry, but also are known to have important applications, especially in the area of synthetic chemistry. A great number of transition metal alkylidene complexes have been synthesized in past decades. One exception is those with rare-earth metal ions. Due to HOMO/LUMO orbital energies mismatch between the d0 rare-earth metal ions and the alkylidene groups, the synthesis of rare-earth metal terminal alkylidene complexes containing the genuine Ln=C bonds is extremely difficult and has not been achieved so far. Chen’s group from the State Key Laboratory of Organometallic Chemistry, Shanghai Institute of Organic Chemistry, is interested in the rare-earth metal complexes bearing multiply-bonded main-group ligands. They have synthesized and structurally characterized the first rare-earth metal terminal imido complex, a scandium terminal imido complex . They also studied and revealed the rich reactivity of the scandium terminal imido complexes, which is distinct from that of the scandium amido complexes. Most recently, they started a study on the rare-earth metal alkylidene complexes. 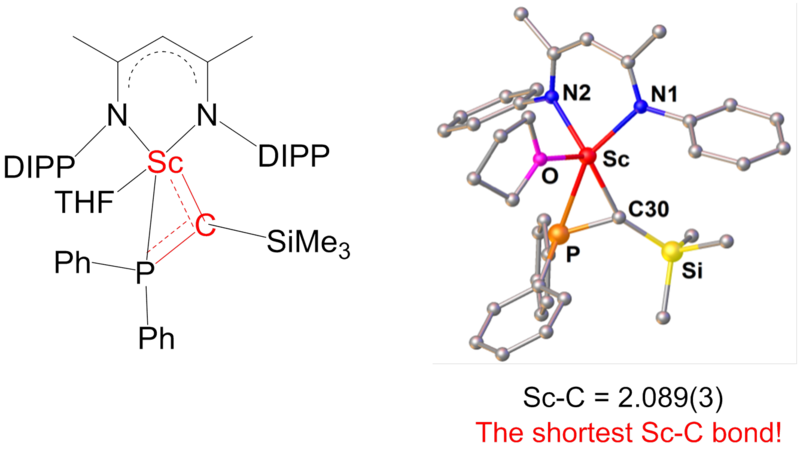 By using a bulky beta-ketiminato ligand, they were succeeded in the synthesis and structurally characterization of the first rare-earth metal phosphinoalkylidene complexes, a scandium phosphinoalkylidene complex. The complex has the shortest Sc–C bond lengths reported to date (2.089(3) Å). Maron’s group from Université Paul Sabatier, France, did the DFT analysis on the bonding of this new complex. This complex is highly reactive. It activates H-H and C–H bonds at room temperature, and also catalyzes the hydrogen of alkene. This work is an important progress in the chemistry of rare-earth metal alkylidene complexes, and indicates the possibility of synthesis and stabilization of the rare-earth metal terminal alkylidene complexes. Financial support for this work was provided by the National Natural Science Foundation of China, the State Key Basic Research & Development Program, the Strategic Priority Research Program of the Chinese Academy of Sciences, and the State Key Laboratory of Organometallic Chemistry.